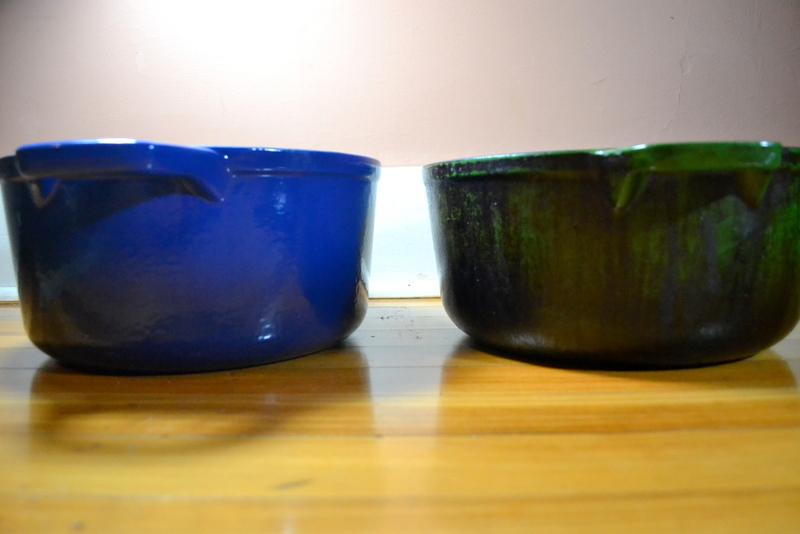 The week before I started this blog, I bought a $40 Tramontina Dutch Oven as a Christmas Gift to myself. Over the years, the stained and blackened pot has become my “go to” pot for everything from deep-frying to slow-cooked stews. So after 4 years of use, I wanted to find a replacement. But unfortunately, the original Tramonita Dutch Oven was discontinued a few years ago. New model us taller, but narrower. In the wake of the Tramontina retirement, Cook’s Illustrated is now recommending the $50 Lodge Quart Dutch Oven. I held off buying it because of the slightly smaller size; 6-quarts compared to the Tramontina’s 6.5-quarts. Because I love making stews, I didn’t want to end up needing more batches to brown the meat without crowding the pan. 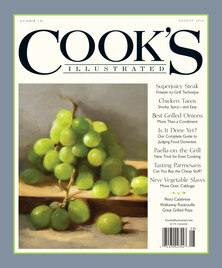 So I was excited when Cook’s Illustrated updated their Website in April 2013 to reflect that Tramonita was planning to release an updated version. A few weeks ago I found the new version was finally available, but with a $60 price tag (which has since been reduced to $40). Both the $50 Lodge and new Tramontina are available from Walmart.com; with free shipping. I bought the new Tramontina because of its slightly higher capacity, but unfortunately, the extra 1/2-quart capacity of the new Tramontina didn’t offer any extra surface area. Both it and the Lodge have the same 10-3/4″ diameter. The complete comparison on the Cook’s Illustrated website is here. The overall winner is the $300, 7-1/4 quart Le Crueset. Diameter: 9-3/4 inches (Amazon says 11-3/5 inches). I believe that the weights listed on the Cook’s Illustrated website are incorrect, that they are a mixture of shipping weights and actual weights. It says that the Tramontina weights 19-lbs (which represents the shipping weight rather than the actual weight), whereas I believe that the 13.7-lbs of the 7-1/4 quart Le Crueset represents the actual weight of the pot. After buying the new Tramontina, I noticed a week later that Walmart reduced the price from $60 to $40. Because I have a Walmart so close to where I live, I ordered the $40 pot, and returned the $60 pot in-store. In the end, I plan to use the old stained pot to deep fry; chicken, french fries, donuts, etc. ; and use the new pot to make stews and other more delicate dishes. Certainly worth another $40 if I can get another 4 years of happiness out of the pot. You are currently browsing the My Year Cooking with Chris Kimball blog archives for the day Saturday, November 30th, 2013.